Intex Challenger K1 Kayak Review - Should You Buy It? Intex Challenger K1 Summary: Why Is It A Good Buy? Well… why should you buy this kayak? Now, let’s take into account that it is an inflatable kayak. It comes with a good pump, a repair kit to quickly fix any problem and a paddle. I usually don’t start with the bad, but the paddle is not so good, but for the price, it is easy to understand why they cut corners with it. You can also upgrade the paddle I would check out our top kayak paddles guide to find the one to suit your needs. 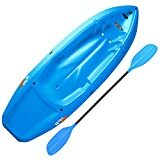 If you are planning to use it on lakes and calm rivers, then this is a fantastic choice: cheap and perfect for both environments. Just that, if you have plans to use it in the ocean or wild rivers, I’d not recommend it to you, because it’s not been designed for those water conditions. 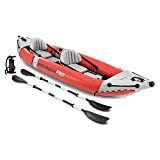 I’d never take it for a competition or to difficult water conditions, but for giving it your first try or only using it for recreational purposes, I believe it is a good buy due to its low price. But there’s more than a simple, nice price tag: the stability is outstanding. This is a common downside in inflatable kayaks – especially cheap ones – but the Challenger K1 brings you plenty of it, so you can remain in control and have a pretty smooth time kayaking. You can even try to stand up, and it will resist. It is that good, and a complete bargain for the price. It is also surprisingly strong and has a weight capacity of up to 200 pounds. Surprising for a lightweight inflatable kayak, right? Well, it is made of highly durable plastic, so you should be fine if you use it in the water conditions it was built for: calm rivers and lakes. Worried about comfort? Then you shouldn’t because the cockpit is large enough for you to sit and feel comfy while kayaking. You can spend hours after hours using it without feeling uncomfortable. It also takes just 10 minutes to inflate and barely 2 minutes to deflate. And well, as it is an inflatable kayak, you can transport and store it with ease. That’s a major bonus! Final Verdict: For the price, it is a no-brainer because it brings you everything you need for a good time kayaking. But well, if you asked me: “Hey, would you use it for some racing or in pretty wild water conditions?” Then my answer would be NO. I’ve already explained it. The paddle could be better also, but hey, for the price you cannot complain! It is highly stable if used in the right water conditions if you bend over that, then you could end up taking a swim. Respect the limits, because again, this is a budget-friendly kayak. Now let’s review it in more detail, so you can determine if it is what you are looking for! Can you see now why I say it is very complete? Moreover, it is super easy to inflate, because the pump is quite good. Want to do it faster than 10 minutes? Then simply get an electric pump and that time will become much shorter. The paddle is not the strongest point, but it gets the job done. If you are a total beginner, then this paddle will allow you to set the foundation necessary to progress further with a better kayak. Just a word of caution regarding the inflation process: don’t overinflate it. Although it is made with durable welded material, over-inflating it will weaken it and make it more likely to get damaged. Remember this when setting it up. The repair kit is another excellent addition. Thanks to it you can fix any small leak quite quickly, just bear in mind that this kind of kayak, due to its intrinsic nature, won’t stand significant damage. That’s why it is important to inflate it correctly and to avoid zones where it could get damaged. And finally, but not less important, is the fact that it comes with a cargo area to store some extra gear. This makes things even better because you can bring some important things with you on board, which will be kept in place thanks to the highly resistant net. Is It Right For You? Let’s Find Out! Is this kayak exactly what you are looking for? You already know what it offers, so let’s see if it is the right pick for you or not. If so, then this could be a great low-cost way to get started on the right foot. It is inexpensive, so you can practice with it in tranquil waters and learn how to use it without investing a small fortune. It is not hard to use, it is comfortable and is a complete package… what else could you ask for? The weight capacity even allows you to bring your dog on board, just take into account the weight limit of 220 pounds. Obviously, if you are a big boy whose weight is beyond that limit, then you should know get the Intex Challenger K1. Of course, the kayak is enough for them and the fact that its design is very easy to spot, this adds plenty of value in terms of security. 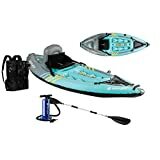 This is a great gift for your son, daughter, small brother or cousin wants to get started with kayaking because this will serve them as a way to get their feet wet in this exciting sport. You expected it, haha. Well, if your budget is not so permissive and you still want to get started in kayaking ASAP, then the Intex Challenger K1 is the perfect way to do it while keeping your costs low. I’m assuming you are also a beginner, so now it is two times more advisable for you than moments ago. An excellent choice, you won’t be disappointed! It is hard to go wrong with this kayak. Although it is not the best in the market, for its low price, it is a beast. You won’t win any tournament with it, but hey, it will help you to learn the basics of kayaking and allow you to enjoy of exciting or relaxing days kayaking. This kayak also features on our Top Blow Up Kayaks.